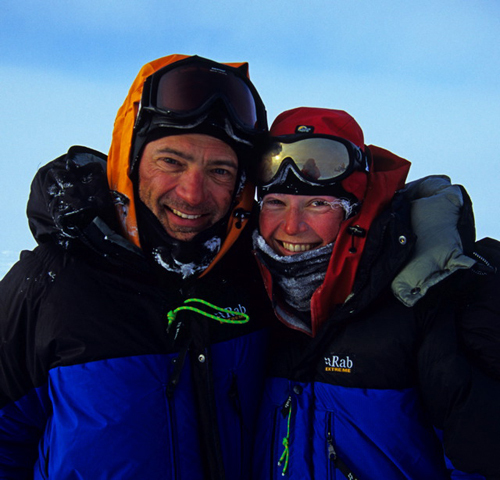 In 2005 Rob and Jo Gambi became the first married couple to achieve the ultimate adventurer's ambition when they climbed the "Seven Summits" (the highest mountains on all seven continents) and skied to both the North and South Poles. Rob is also the first Australian and Jo the first female to achieve this feat. In 2005 Jo entered the Guinness World Records for the fastest female ascent of the "Seven summits" and she is now the only English woman alive to have climbed Everest's more difficult and daunting North Ridge. What makes their story even more remarkable is that they achieved all this while Rob was in remission from his second bout of cancer. Having been warned that his cancer could recur, Rob and Jo both left their jobs in order to spend as much time together as they could and embarked on what was to become an incredible adventure. Rob was born in Sydney, Australia in 1958. Throughout his school years Rob was an active sportsperson taking part in as many sports as possible including tennis, martial arts, soccer, running and many more. In 1995 Rob first met Jo on a sailing course on the south coast of the UK. The second time was in Chamonix France while Jo was on a climbing holiday. They got married in September 1996. In 2000 Rob was diagnosed with his second bout of Cancer. This led to a major operation, plus an aggressive course of chemotherapy followed by radiotherapy treatment. After recovering from this, he decided to take some time out with his wife Jo. Rob left his job in 2002 when they began travelling together. Since returning from their travels, Rob now works as a Managing Director with UBS Global Asset Management. Jo was born in the UK in 1969. From an early age Jo was involved in various physical pursuits from ballet to skiing to climbing and her family holidays always had an outdoors focus and were often spent sailing on the south coast and hiking in the Lake District. Jo regularly represented her school and competed successfully over many years in both short and long distance running at county and district level. After Rob's second episode of cancer in 2000, Rob and Jo decided to take some time out and left their respective jobs to travel in 2002. Since returning, Jo has written a book â HOLDING ON - about their adventures which has been published by Piatkus.